The first part of this site is intended as a general purpose guide for hurricane and flooding preparedness and has been compiled from sources including The National Weather Service National Hurricane Center and the Institute of Inspection Cleaning and Restoration Certification. It is very important to stay well-informed of weather conditions in your area and identify local hurricane shelters/community resources. This guide will also provide instruction on how to deal with water damage and mold remediation once the storm has passed. Use caution when entering a water-damaged space. Depending on the size and scope of the job, the services of a professional mold remediator may be required. Map out the safest evacuation route inland. Know where to find the closest local storm shelters. Buy canned/dried food that will keep and store enough drinking water. Purchase plywood or other material to protect your home. Trim any trees and shrubbery so branches don’t fly into your home. Clear any clogged rain gutters and downspouts. Have a place to move your boat. Check your insurance policy to confirm that you are covered for any property damage. Know the location of pet-friendly hotels on the evacuation route. Check radio, TV or NOAA Weather reports recently for updates. Social media is also an excellent source of up-to-the-minute information so be sure and check Twitter feeds for storm-related hashtags. Listen for official bulletins of the storm’s progress from Radio All Hazards. Fuel up family vehicles so they are ready to go. Inspect and secure all mobile home tie downs. Have extra cash on hand. Prepare to cover all windows and doors with shutters or other shielding material. Check batteries and stock up on canned food, first aid supplies, drinking water and medications. Remove light-weight objects like garbage cans, garden tools, toys and lawn furniture from your yard. Closely monitor radio, TV, NOAA Weather, Social Media (Twitter, Facebook). Tune to Radio All Hazards for official bulletins. Close any storm shutters Follow all instructions issued by local officials and leave immediately if ordered. Notify your neighbors and a family member outside of the warned area of your evacuation plans? Set refrigerator to maximum cold and kept it closed. Turn off gas/electricity/water (if told to do so by authorities). Remember to turn off and secure any propane tanks. Fill the bathtub and large containers with water should clean tap water become unavailable (Use water in bathtubs for cleaning and flushing only. Do NOT drink it). Stay away from windows and doors, even if they are covered. Take refuge in a small interior room, closet or hallway. Close all interior doors. Secure and brace external doors. If you are in a two-story house, go to an interior first floor room. Stay in the halls or other interior rooms away from windows. Lie on the floor under a table or other sturdy object. Tornadoes — tornadoes are often spawned by hurricanes. The calm “eye” of the storm—it may seem like the storm is over, but after the eye passes, the winds will change direction and quickly return to hurricane force. Keep listening to radio, TV or NOAA Weather Radio All Hazards. Wait until an area is declared safe before entering. Stay on firm, dry ground. You can be swept away by water only 6 inches deep. Be wary of standing water, it may be electrically charged from power lines. Dot not attempt to operate a generator indoors. Avoid weakened bridges and washed out roads. Electrical and appliances for damage. Any water damaged areas for evidence of mold. Use a flashlight to inspect damage. Never use candles and other open flames indoors. Wear proper shoes to prevent cutting feet on sharp debris. Do not drink or prepare food with tap water until officials say it is safe. Avoid electrocution by not walking in areas with downed power lines. If your home has been affected by flooding, here are a few simple steps you can follow to reduce property damage and limit health risks to you and your family. Be careful when entering buildings. Make sure electrical power is off and the structure is sound before entering and inspecting a flooded building. Protect yourself. Ventilate affected areas by opening windows, and eventually, by placing a fan in a window once you’ve determined it’s safe to turn the power back on. Work toward the fan as you clean to minimize cross contamination. Know what items to throw away. Porous items that absorb contaminated flood water shouldn’t be restored. Drywall, carpet and pad, mattresses, pillows, box springs and particle board normally should be discarded if wet. Wet clothing and many household fabrics may be salvageable. Machine washing, including at least a 10-minute soak in detergent and hot water, should remove most contamination and stains. Open pockets of saturation. Remove base molding and portions of damaged walls and wet insulation. Locate the water line and measure 15 inches to 20 inches above it. Everything below that should be removed and discarded. Flooring, such as hardwood, laminate or sheet vinyl, should be removed to expose pockets of saturation derneath for cleaning, sanitizing and drying. Clean aggressively. Wall cavities and exposed durable materials (studs, joists) should be cleaned by pressure washing with detergent solutions. After thoroughly cleaning and flushing salvageable materials, apply a disinfectant solution liberally. 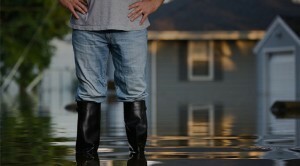 A water restoration professional may be needed to perform this service safely and effectively. Prevent mold growth. Although it takes a few days to appear, mold thrives in a moist environment with organic material (e.g., paper or particle board), and temperatures between 68°F and 86°F. Keep air moving and maintain moderate temperatures as possible. Using an EPA registered fungistat such as Concrobium Mold Control to treat any affected areas. Concrobium Mold Control also creates an invisible mold barrier that keeps mold from returning. Dry out before you rebuild. To prevent dry rot and on-going structural damage, don’t reconstruct or cover wood materials until its moisture content falls below 16 percent. Moisture meters are available online, but it may be best to hire a water restoration professional to confirm proper drying before reconstruction. Consider hiring a professional. A professional water damage restoration company has trained technicians, specialized cleaners and antimicrobial agents, and extraction, drying, dehumidifying and moisture measuring equipment. Protect yourself by wearing personal protective equipment. Goggles, a HEPA face mask and gloves are recommended. Assess the mold damage. Rule of thumb: if the moldy area is more than 10 sq feet or if sewage may be involved, call a pro. Isolate the affected area so mold spores won’t spread. Close doors, close vents and put up plastic sheeting as required. Identify the source of the water damage and repair structures to prevent further water intrusion and damage. Discard porous, replaceable building materials (e.g. carpeting, subfloors, wallboard) and water-damaged room contents. Dry remaining building materials by re-establishing home HVAC systems and turning on fans in the affected area. Treat remaining building materials with an antimicrobial solution to eliminate remaining mold spores and mold staining. Note: Bleach does not kill mold on the types of porous surfaces most affected by water damage. Clean/vacuum surfaces to remove any remaining mold residue and repaint affected surfaces if desired. Rebuild damaged area as required (replace wallboard, subfloor, etc.) and address any remaining sources of moisture. Protect against mold growth by controlling indoor humidity, ensuring proper outdoor grading and applying preventative antimicrobial solutions to vulnerable parts of your home. Click here to find the Concrobium Mold Control retailer near you. To download this information in PDF format, please click here.